Bigger is always better right? It seems that way when it comes to the computer industry and today’s annoucement of the upcoming Ultra 2000W power supply should be no suprise to those that follow the computer hardware. 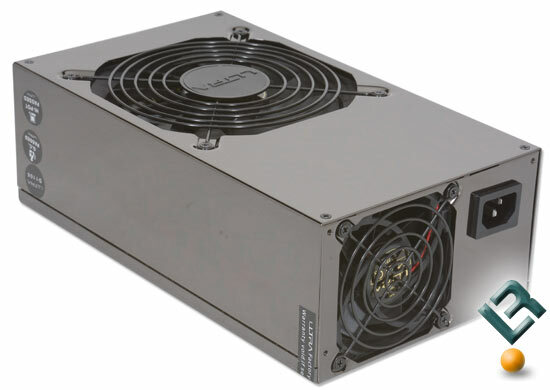 The Ultra X3 Modular 2000W PSU has a footprint that is similar to the PC Power & Cooling 1000W power supply. This means this PSU comes in at 10.25 inches long and doubles the power rating all while keeping the same form factor! With the +12V rail being rated at 1800W that means it can handle an amazing 150A load! To put this into perspective, NVIDIA’s power hungry 8800GTX DirectX 10 compliant graphics cards uses ~30A. If one was to run a pair of 8800GTX graphics cards in SLI it would double to roughly 60A, which leaves another 90A available to use up on the Ultra X3 Modular 2000W PSU. When we spoke with Ultra today on the phone they informed us that the first samples of the Ultra X3 2000W PSU just arrived in the United States this week and are currently being tested by Ultra Products to make sure they are ready to be shipped to retailers around the world. That means the Ultra X3 2000W PSU will be available to consumers sometime in Q1 2007. The Ultra X3 is fully modular and supports a wide range of connectors from the look of the picture that has been released. From the looks of the panel, it will host four 6-pin PCIe connectors. This will handle the four 6-pin PCIe connectors that the GeForce 8800 GTX SLI requires, but when later this year when three graphics card become the new thing consumers will find the need for six 6-pin PCIe connectors. 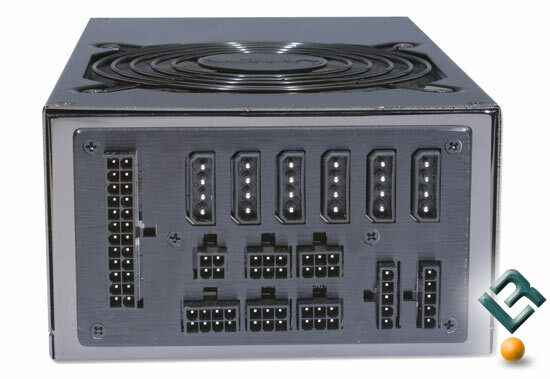 Hopefully Ultra Products is shipping this power supply with modular cables that will “split” each PCIe header into two connectors! When looking at the label on the Ultra X3 PSU, we noticed that it only lists one +12V rail, which leads us to believe that it only has one +12V rail. That does cause some concern though as the form factors ATX12V v2.2 guidlines suggest a second +12V rail be made available on power supplies that are used in situations where components will draw more than 18A. We again contacted Ultra Products and their marketing department said it had one rail while an Ultra Employee (R&D schlub according to himself) told us that he was unsure. When it comes to pricing Ultra refused to comment and will let us know what the MSRP is closer to when it launches. With the PC Power & Cooling 1000W power supply running $599.99 at Newegg, one can only expect this 2000W power supply to be more. One of the major factors when it comes to cost is the build of materials and if it only has a single monster +12V rail this power supply might be really affordable as it won’t require and a number daughter boards (PCB’s) inside. While these are all guesses for now, time will tell, and when we see it in person we will know right away what is going on. The Ultra X3 Modular 2000W PSU will be on display during CES and Legit Reviews will be at the event bringing you exclusive pictures of this and other upcoming hardware by Ultra Products next week! UPDATE: Ultra doesn’t expect this power supply to cost more than US $499!